Ford has developed a wearable device that enables production line workers to make faster and more accurate quality checks on new vehicles. 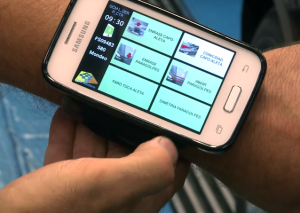 This wrist-worn device was tested at the company’s manufacturing facility in Valencia, where it replaced the outdated paper-based system that involved walking back and forth more than one kilometer daily to access information on desktop PC’s. When connected to a smartphone app, the Portable Quality Assurance Device allows specification and quality checks to be made on the spot, greatly improving accuracy and efficiency in the manufacturing process. “We have varied options and features across our vehicle range and digital innovation in our plants helps to generate lean methods within the manufacturing process,” said Linda Cash, vice president, Manufacturing, Ford of Europe. According to Ford, the Bluetooth-enabled device recognises “the exact quality inspection requirements” for each vehicle that passes along the assembly line. These quality requirements are displayed on the touchscreen of the device, and team members are then able to instantly follow up and approve. Ford says that the new system has helped to reduce human error by 7 percent while also reducing the time required for each vehicle check by seven seconds. The company’s Valencia plant builds six nameplates and even more body styles, including the Mondeo sedan, the Mondeo Vignale, Kuga SUV, Transit Connect light commercial vehicle, Tourneo Connect people-mover, all-new S-MAX multi-activity vehicle, and Galaxy seven-seat people-mover. The facility is currently undergoing a €2.3 billion modernisation which will transform it into one of the world’s most advanced, flexible and productive auto plants. “Smart mobile technology increasingly helps my colleagues and my family organise our personal lives. It struck me that we could apply similar technology to the workplace – and improve the automotive production process,” said Ford production manager Ramón García. Ford said that it is planning to roll-out the wearable device to other plants after the successful pilot project in Valencia.